An hour's ferry ride from Irago Port, past rocky monoliths covered in forest green the texture of delicate broccoli florets, is Mie prefecture. Certainly, the Irago peninsula is beautiful, with its beige sand beaches, ample fishing and picturesque sunsets, but one gets the sense that for travelers, at least, it's more the rest stop than the actual destination. For many Japanese, Mie, home to the most important Shinto shrine in the entire country, is a site of annual pilgrimage. Tourists tend to go on to Nagoya, but Ise Shrine falls neatly into the category of Things You Have to See. 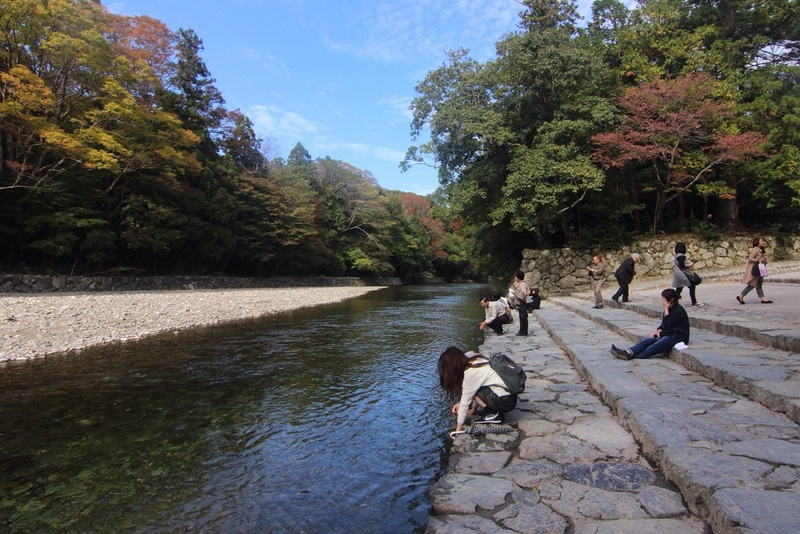 Visitors relaxing by the river. Passing under a large, natural wooden torii and over a bridge high above a shallow river, the entire shrine complex, with its gravel paths and ancient wooden structures, is thoughtfully carved into the forest. Some areas have manicured trees and potted flowers, and yet the overall effect is still one of peaceful harmony. I'm told that this area of Japan (including the Irago peninsula) has some of the oldest land, not just in the country, but in the entire world, and that entire pockets of virgin forest exist to this day. It's lovely at this time of year, when the leaves are starting to change from emerald green to fiery shades of orange and red. Apart from the fact that it's dedicated to Amaterasu, the rain goddess, Ise Shrine is unique amongst Japan's many Shinto places of worship in that it's one of the oldest. Unlike Buddhist temples, which are always thick with smoke from candles and incense, and full of tables threatening to collapse under the weight of offerings, Shinto shrines are quite sparse. People come, rinse their hands, bow and clap their hands several times, and perhaps toss some coins into the provided wells; a quiet and simple affair. After traversing the entire park, marveling at all the old trees and thickness of the shrine's thatched roofs (2 feet at the widest point! ), I returned to what had initially interested me the most: Oharaimachi, the nearby shopping district. Consisting of one main promenade and various little side streets, it's reminiscent of the beginning of Spirited Away, when Chihiro's family happens upon the food stalls that turn her parents into pigs. (And by that I mean the old architecture, the alleyways and traditional food; as far as I know there is no human transfiguration involved). This area is known for many culinary specialties, ranging from sweets like tofu donuts to savory dishes including udon and skewers of various seafood and shellfish, that are served in traditional tatami rooms, tiny stalls, and holes in the wall with wooden benches outside. It's dangerously easy to leave laden with souvenirs from the shops, like non-perishable foods, fancy ohashi, ceramics, textiles, baskets and toys. (For me, traveling as light as possible, food seemed the best option. I opted for matcha mochi and shortbread cookies shaped like dogs. Alas they are all gone now). On the way back to the ferry port I stopped at Futami to see the Meiotawa rocks, linked together by a ton (literally) of rope and representing union in marriage. A small shrine nearby featured statues of frogs in all shapes and sizes, which apparently represent fertility in Japanese culture. I guess that explains why I saw so many couples there. I still am not used to how many babies and children I see in Japan, considering that back in San Francisco, 97% of the population is over 18. An unfortunate side effect of the tech boom: a plethora of single males that results in phenomena like Visible Man Lines. See more of Mie on Flickr. To see what gender imbalance looks like, drop by a house party held by someone who works in tech. Bonus points if it's in the Mission, SoMa or North Beach.